I ear-marked most of the recipes as I flipped through, making it a goal of mine to try every single tip, trick, and meal I had selected. 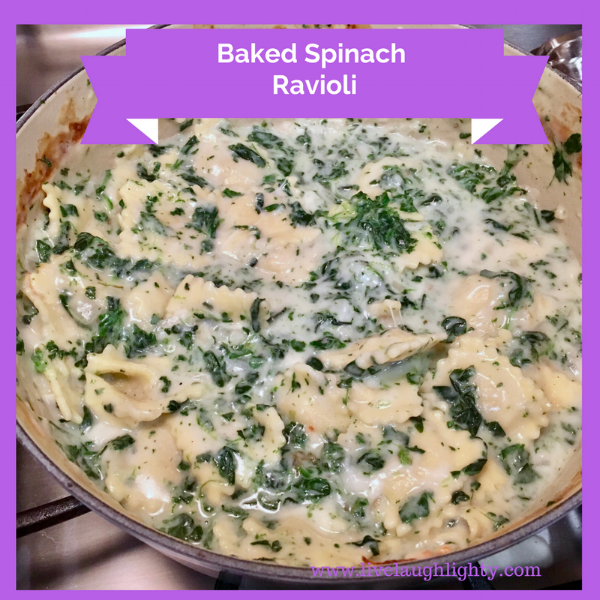 Last night, I embarked on my mission with the Baked Spinach Ravioli. Halfway through the recipe I realized I needed a bigger skillet, so I switched from my iron skillet to my trusty Dutch Oven. I swear, I use that thing for EVERYTHINGGGGGG! It's fantastic. 1. Preheat the broiler. Melt the butter in a large ovenproof skillet over medium-high heat. Add the onion, garlic, and rosemary and cook until the onion is soft and starting to brown, about 6 minutes. Stir often. 2. Sprinkle in the flour and cook, stirring, until smooth and bubbling, about 2 minutes. Stir in 2 cups water, the milk, 1/2 teaspoon salt and a few grinds of pepper. Bring to a boil, then reduce the heat to a gentle simmer. 3. Stir in the ravioli and cook, stirring occasionally, until the ravioli are tender and the sauce thickens, 5 to 7 minutes. 4. Remove from the heat. Discard the rosemary sprigs and stir in the spinach. Sprinkle with the mozzarella and grana padano/ parmesan. 5. Place the skillet under the broiler until golden and bubbling, about 5 minutes. 6. Mix it all together & enjoy! This recipe is uber cheesy, so if you're a cheese lover like J and I are, this is a great go-to.